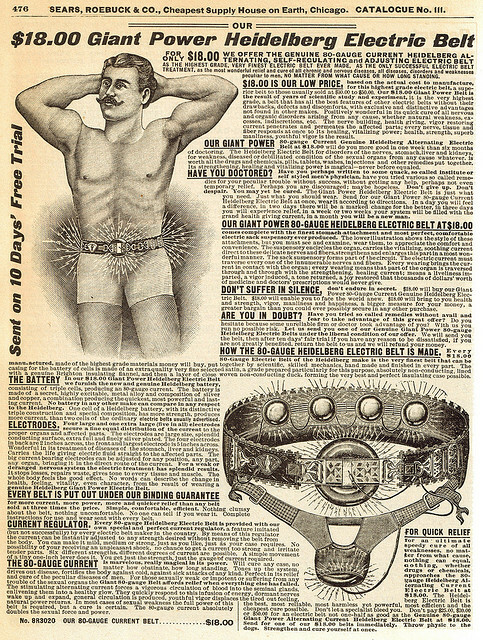 FOR NERVOUS DISEASES of all kinds in men and women, to reach the nerve centers for the cure of all nervous disorders the Heidelberg Electric Belt stands alone. For weakness in men and women, personal exhaustion bringing back lost strength and power, over brain work, vital , impotency, rheumatism, sciatica, lame back, railroad back, insomnia, melancholia, kidney disorder, Bright's disease, dyspepsia, disorders of the liver, female weakness, poor circulation, weak heart action and almost every known disease and weakness. The constant soothing alternating electric current is ever at worktouching the weak spots, building up the system, stimulating the circulation. 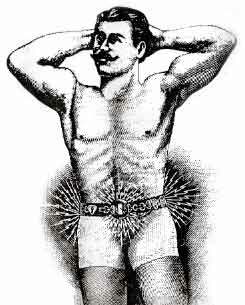 ALL THAT ELECTRICITY WILL DO FOR YOU WILL BE RECEIVED through the use of our electric belt. Credits.Text: Sears 1900 catalogue. Graphic from the Giant Heidelberg Belt poster, Museum of Questionable Medical Devices.